Wasted Women? Well they do meet regularly in a church and they all share a common addiction—to fabric--but they are far from wasted! In the true spirit of giving, two local quilting groups presented 76 quilts and 15 pillowcases to St. Vincent de Paul at noon, Tues. Dec. 2 at Highland Road Presbyterian Church. Debra Blacher from St. Vincent de Paul was on hand to accept the quilts that range in size from crib, to lap-sized, to twin and full-sized quilts. The quilts will be put to good use at their Sweet Dream Women and Children’s Shelter. Most of the quilts, 61, were made by members of The Wasted Women’s Bee, a local group that accepts donations of cotton fabrics and sewing room waste and turns them into quilts for various charitable organizations. An additional 15 quilts and pillowcases were made by Granny Hugs of Gonzales, a group that also accepts fabric donations and donates the finished product. The Wasted Women’s Bee, WWB, works closely with TGQ. The WWB is a group of dedicated local quilters who recycle donated fabric, unfinished projects and sewing room waste into quilts for charitable donations. All are self-professed “fabricaholics” who can’t bear to see bits and pieces of good fabric thrown away so they meet and sew the stray parts into quilts. The quilts go to any worthy organization that fits the type and style of fabrics used in the quilt. Many go to children who have suffered severe trauma or other health issues while others go to soldiers, nursing homes, hospitals, hospice or similar organizations. The group meets twice a month on the second and fourth Tuesday at Highland Presbyterian Church, 10024 Highland Rd. in Baton Rouge from 9 a.m. – 2 p.m. There are always donations to sort, quilts to bind, kits to cut, or borders to add. Sometimes a class is held to focus on a single technique and everyone comes with sewing machines ready to sew. Often members simply drop by to pick up a pre-assembled kit and take it home to sew. Joining the group is not difficult – you just show up. For more information, email us at thegivingquiltinc@gmail.com. 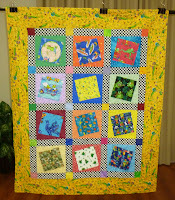 Non-members often donate quilt tops or fabric for the group to use. The quilts themselves are also used as teaching tools for students who want to learn to quilt on a domestic or long arm machine. Machine quilting is a skill that requires lots of practice, and the charity quilts are a good way for students to get in the practice hours they need. Recently Mama’s Quilt Shop in Independence donated several tops, and all will be quilted by students. Occasionally the group will make a special quilt for a specific group and sometimes a special quilt is set aside until the right opportunity comes along. For the past several years they have also made Christmas stockings for the local YWCA. A select few are auctioned at the December Connections luncheon while the rest are sold to participants. Any leftovers are given to families in need. The benefit is twofold. The stockings help the YWCA with their fundraising efforts and the smaller project item helps the quilters “clean the cupboard” of leftovers. The problem with leftovers is the more you make, the more you get, so the cycle continues. You can never use up all that sewing room waste. And the Wasted Women? Why, they don’t waste a thing.